Whoever came up with Central Intelligence’s tagline (‘Saving the world takes a little Hart and a big Johnson’) deserves some serious kudos – the filmmakers themselves not quite so much. Rawson Marshall Thurber (Dodgeball, We’re the Millers) takes the reins of a sporadically bombastic, gooey-centred bromance, a movie where the considerable charm and chemistry of its leads just about makes up for the distractions of a preposterous plot. Following quickly on from The Nice Guys, this less accomplished odd coupling more closely resembles the style of chaotic bonhomie rocked by the Jump Street franchise – particularly given the film’s dopey beefcake / exasperated rule-follower combo. Dwayne ‘The Rock’ Johnson plays the bumbag-sporting Bob Stone, a man who’s reinvented himself after the humiliations of high school. Kevin Hart is his former schoolmate Calvin Joyner who, 20 years previous, was voted ‘Most Likely to Succeed’ but whose his career has since stalled. When Bob sends him a friend request, Calvin unthinkingly accepts, only to be drawn into jeopardy when his seemingly sweet new pal turns out to be a CIA agent gone rogue. 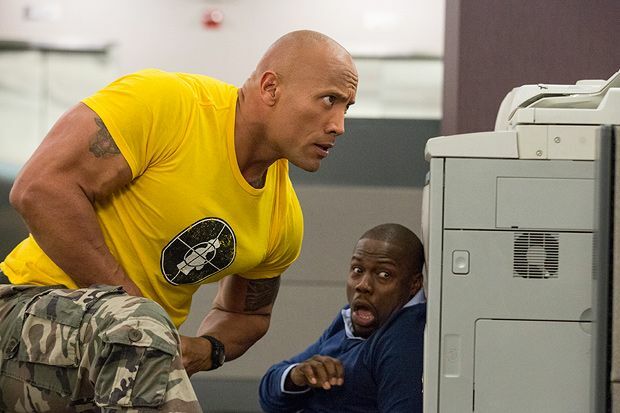 Central Intelligence will rapidly have you onboard with its benign tone and loveable leads. Yet story-wise it’s a real mess: the ostensibly complex but truly moronic narrative barely joining the dots between a series of pretty random situations and set-pieces (a bar brawl, an office shoot-out, a sleepover, a high school reunion). Best in moments of downtime as the two feel out their unlikely friendship, Hart’s loud-mouthed bemusement is an excellent match for Johnson’s mad, puppyish enthusiasm (‘I'm a hugger!’ the latter excitably boasts). And if Johnson’s comedic delivery is a touch affected, especially by comparison to the naturally gifted Hart, it’s a winning performance all the same. Meanwhile, fun references and welcome cameos add to the appeal of a film that’s much more successful in its stupidity than when it strives to be smart. General release from Fri 1 Jul.